I just hit the minimum playable milestone. So it's time to post it up here! I'd absolutely love to hear feedback, but keep in mind that this is the earliest of alphas. I've put just enough polish on this to not be completely embarrassing, but it's still very simple and feature poor, it doesn't have any sound yet, and most of the artwork is not final. 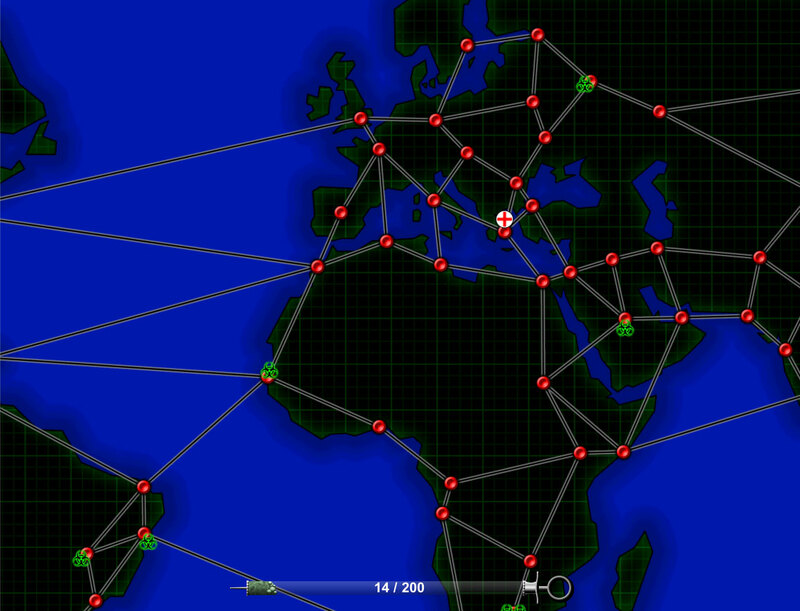 In Vector Control, you're fighting a pandemic, spreading across the globe threatening to destroy humanity. As an agent of the CDC, you move frantically from city to city chasing the plague, trying to get ahead of it's deadly multiplication. The controls are entirely mouse driven. Click on a city to move there, and click on the city you're on to eliminate one unit of disease. Diseases will occasionally reproduce, generating another unit of disease on the city they're on, and they'll occasionally move to neighboring cities. However, the last unit of disease will never leave a city, so once infected, a city will never be cured without your intervention. You win the game by eliminating all the units of disease on the map. You lose by the disease getting sufficiently out of control that there are 200 units on the map. You can look to the syringe on the bottom of the screen to see how close you are to victory or defeat. Note: The Mac version is not yet tested. I'm trusting that Unity built it correctly. If you try it out, please let me know whether it worked! The game as it stands is rather shallow, but I think it could be the seed of something great. So here are the things I hope to add to it, over time, to deepen it into a really compelling experience. Quarantine - Drop in the current city. For some period of time, no diseases can enter or exit this city. Good for isolating infected parts of the map from clean parts. Clinic - Drop in the current city. Lasts much longer than a quarantine, but still eventually runs out. Will periodically cure one unit of disease in the city. Useful to place on the clean end of very long connections, so you don't have to worry as much about diseases occasionally spreading along those lines. Chartered Jet - Move very quickly directly to any city on the map. The value of this should be obvious. I'm sure I'll think of a few more, given time, but these are a good starting point. Variants of the world map with more or fewer cities, to provide faster or slower games. Regional maps, which zoom in on, say, North America, Europe, China or Africa, and include a lot more of the local cities in those regions. Maybe even some fictional maps! Alternate maps should be easy to make, so I expect to eventually have a wide selection. I'd like to have diseases that have different attributes, to change up the game a bit. Possibly even include multiple different disease types in the same game at once. The game will need sound effects and music. I'll likely need to get some help on this, as audio is really not my area. All of the art in the game right now I made myself. I'm not completely incapable in this area (unlike audio), but it's still not my area of expertise. I'd like to get a professional artist on this eventually. I want to have solid support for both traditional gamepads and the Steam controller. This should be a good couch game. If the game is sufficiently successful, I might even investigate console versions. But I have no idea what would be involved in getting it on PS4, XBox One or Wii U. This game should work very well on phones and tablets, so Android and iOS versions will hopefully come eventually. It would be great to be able to team up with your friends to fight more challenging scenarios together. This would build on the gamepad support. This is a harder thing, but if there's sufficient demand I'd give it a try. The current loss conditions were just the simplest, most obvious option. I'm also considering the possibility of giving each city a population, which is slowly eaten away by the diseases in the city. You'd lose when the world population dropped too low to sustain itself. This is still an idea I'd have to experiment with. I'm not convinced it would actually be more fun than the current system. So over the past two weeks, since I first published the article on simplectic noise, a number of people have ported it to other languages, and I've continued to work on and tweak it. Many people have pointed out flaws in the algorithm, and I've discovered a number of my own. All together, I'm left to conclude that simplectic noise doesn't actually have much value. Basically, I failed to account for the fact that the range was squared, and thus the value it's being subtracted from also needed to be squared. The surflets in 2D needed to have a radius of sqrt(0.5), so I need to subtract the range^2 from sqrt(0.5)^2, or 0.5. This resulting in the surflets having a radius of sqrt(sqrt(0.5)), or ~0.84089641525, which is larger than a simplex. This created discontinuities at the borders of the 2D simplexes. The gradient falloff function happens to go near zero at about 60% of the radius of the surflet, so these discontinuities were very subtle. In most cases, they were impossible to see with the naked eye, which is why I didn't notice them. However, at very low frequencies, or when used as a heightmap, the discontinuities can become very apparent. So, easy enough to fix, right? Well, first of all, when you fix the math the surflets become just a little bit too small. It becomes easy to visually pick out individual surflets. Now, it turns out this problem exists in simplex noise as well, so it can't be that bad, right? Well, in simplectic noise, the problem is exacerbated in higher dimensions. It's not that bad in 2D, but it's horrible in 4D. I've also gained a deeper understanding of OpenSimplex noise. The reason it's so complicated is because it's solving this exact problem. It samples a few extra surflets, from outside it's immediate shape, in order to allow the surflets to have a larger size. While this adds a lot to code complexity, and significantly hampers performance, it makes the quality of the noise actually higher than simplex, and much higher than simplectic. So in all dimensions, it's quite a bit slower than Perlin noise. And in 3D and 4D, it's also much lower quality. So there's really not much left to recommend it. I'm sorry for publishing my results to this blog prematurely. Perhaps the concepts behind simplectic noise will inspire some other innovations, but for now I hope people haven't wasted too much time on it. Since I no longer believe simplectic noise to be valuable, I'm pulling it out of the noise-rs library I'd originally written it in. To save the reference implementation for posterity, I've created a new github repo for it here. 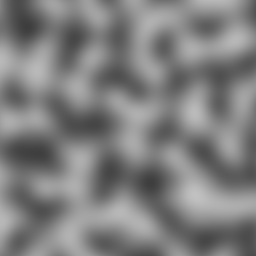 One of the optimizations that Travis had made to Perlin noise had to be rolled back, which caused the 2D Perlin to get a bit slower, but otherwise had a minimal effect. I've updated the benchmarks above. Notice: Since posting this, further work showed that the algorithm described here is not actually particularly useful. See the follow-up blog post for details. This post is preserved, with only slight modification, for posterity. 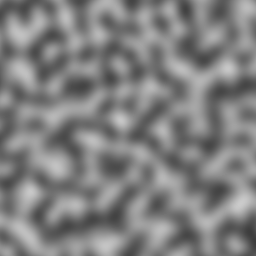 This post is about a new gradient noise function I've invented which should help to fill a hole that's existed in this space for some time now. I call it simplectic noise. But first, to put this in context, some history. Back in 1983, Ken Perlin published an algorithm known as Perlin noise. It was for creating smooth, continuous, random values over space, which has numerous applications in 3D graphics and elsewhere. 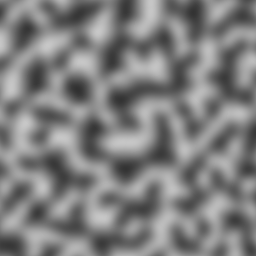 Perlin noise, and it's variants, have become one of the primary tools for creating computer-generated random content (also called procedural content), particularly for natural terrain or textures. Perlin noise works by dividing space up into squares, cubes, tesseracts, or whatever kind of hypercube is appropriate for the number of dimensions you're using. It figures out which cell you're in, and assigns a random gradient to each corner of that cell, then blends those gradients together. Because the given corner's gradient is chosen solely based on the coordinates of the corner, a neighboring cell sharing the same corner will choose the same gradient for it. This means that neighboring cells blend smoothly with each other. 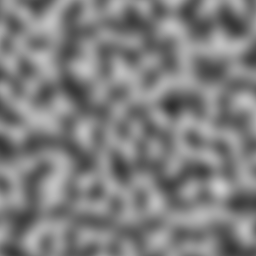 Because of the way it works, Perlin noise and it's variants are collectively known as gradient noise. 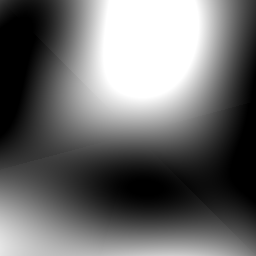 The simplexes aren't axis-aligned, so there aren't any obvious directional artifacts. The number of points that must be considered only increases by 1 for each additional dimension, whereas Perlin noise doubles the number of points with each dimension, so simplex noise is much faster to calculate at higher dimensions. This is an excellent noise function. By most measures, simplex noise is still the best gradient noise function available. But there's a problem. Soon after Perlin published simplex noise, he also secured a patent for it. This makes it a non-starter for a lot of smaller, independent developers, who don't want to deal with the potential legal issues of using a patented algorithm. In September of 2014, only a little over 3 months before this blog post, a post was made on Tumblr describing an algorithm they called OpenSimplex noise. The primary intent is to achieve the advantages of simplex noise without hitting the patent restrictions. 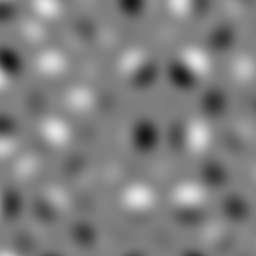 This uses yet another kind of spatial tesselation, known as a simplectic honeycomb. In 2D, a simplectic honeycomb is identical to a the triangular tesselation used by 2D simplex noise, but that's okay because the simplex noise patent only covers 3 or more dimensions. In 3D, a simplectic honeycomb is actually a combination of tetrahedrons and octohedrons. This makes the process of figuring out which cell a given point is in actually very complicated, and in 4D it's a great deal more so. In addition, OpenSimplex noise expands the range of the gradients a bit, so they can extend a little bit into neighboring cells. This theoretically makes the noise a little bit smoother, but it also means that extra cells need to be checked. 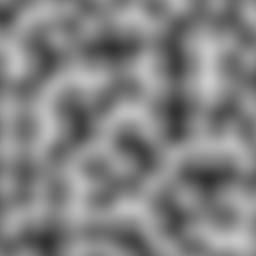 Despite this, the blog post claims that OpenSimplex noise achieves better performance than Perlin noise, even if it's not as good as simplex noise. My own experiments disagreed, but this is possibly due to not sufficiently optimizing the OpenSimplex port I was working with. This optimization is a difficult prospect, given that the complexity of the algorithm. And this leads us to my own noise function. I'm working in Rust, which is an experimental new language I've grown very fond of. The OpenSimplex reference implementation is in Java. So I needed to port it over. The 2D OpenSimplex function wasn't so bad. The 3D one, however, was 558 lines of complicated nested if statements. It was nigh impossible to really understand it, so I just did a raw port, pasting it into Rust and chasing down compile errors until it worked. And surprisingly, it did work. Then I looked at the 4D noise function, which is 1311 lines of even deeper and more complicated nested ifs. My resolve broke. An N-dimension simplectic honeycomb is composed of layers of (N-1)-dimensional simplectic honeycombs. This means that in order to get the value for a given point in N-dimension space, I just need to figure out which two layers it's between, and call the (N-1)-dimensional simplectic noise function twice, once for the layer above this point, and once for the layer below it. This makes the code incredibly clean and easy to understand. While I've only extended this up to 4D, I could very easily write 5D, 6D or 7D versions. Unlike simplex or OpenSimplex noise, the code size increases linearly with the number of dimensions, and I'd argue that the code complexity increases is something like log(n), because the higher-dimensional versions are just simple functions that call into the lower-dimensional versions. Note: The benchmarks originally posted were very different, and inaccurate. This has been corrected, but the blog post from this point down has been heavily edited to reflect that change. As you can see, in 2D Perlin is the fastest, but in 3D and 4D Perlin and simplectic are almost the same performance. OpenSimplex is the slowest in both 2D and 3D, though again this may be at least partially due to my inability to effectively optimize the 3D OpenSimplex noise, since it's so difficult to understand. So we can see that simplectic noise provides higher quality output than Perlin noise, with about the same performance characteristics. OpenSimplex noise doesn't SEEM to live up to it's performance claims, but I'm not willing to make that claim too strongly based on the implementation I have. Anyway, if you're anything like me, you're probably itching to see the implementation. You can find it on GitHub here. The library is under the Apache license, but unlike Ken Perlin, I'm not going to take any steps to protect the algorithm itself. Port it to whatever languages you want. Innovate and hack on it. Make it better, if you can! All I ask is to let me know if you do anything really cool with it. Some new developments are throwing my performance numbers into doubt. The LLVM optimizer may have been aggressively const folding my code. I'll post more here when I have better info. Travis "Amaranth" Watkins has done some work on fixing up my benchmarks, so with his help I've got better numbers now. I've updated the post above to reflect his information. It's not nearly as flattering to simplectic noise, which has now been shown to have generally comparable performance to Perlin. This is still valuable, however. Discovered a tragic flaw in the algorithm, and further work showed the performance to be significantly worse than what's reflected in this post, even after the last update. I can no longer recommend anybody use simplectic noise. I've added the notice at the top of this post to that effect. See the follow-up blog post for details. So spiritofiron.com was previously hosted on Linode. It wasn't terribly difficult to setup. I got WordPress working on it, and it chugged along just fine for about six months. They were going to reboot my server because they had detected some issues with it. The machine was experiencing a hardware failure, and they were going to transfer the drives to a known good machine. This was taking longer than expected, and they had no ETA. Their attempt to recover my data was unsuccessful, but they were going to setup a new, equivalent Linode on a new machine for me, and give me a three month credit on my account, as way of apology. Instructions for how to restore my data if I had paid for the extra backup service (which I hadn't even realized existed as a separate, special service). The new Linode was setup. The entire thread happened over the course of a few hours early Wednesday morning. By the time I got up, it had already played out, and I read over the entire thread multiple times, in shocked disbelief. Needless to say, I decided I was done doing business with Linode. They're friendly and helpful, their rates aren't unreasonable, and there's a lot of good things I can say about them. However, their competitors can offer me real assurances, which I have reason to trust, that this sort of event will never occur, short of an apocalyptic disaster. I briefly considered AWS, as they seem to be the most reliable hosting service available. However, I realized that what I was hosting was essentially just a blog, with an attached gallery and a few downloads. Blogger can give me all that, and it's a hell of a lot less effort. That means I can spend more time working on the project that this site is meant to showcase, and less on building and maintaining the site itself.